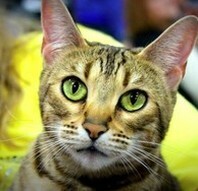 The Toyger breed has been created using many different breeds and "moggy" cats over the last 20+ years. It is widely believed that the Toyger is simply a striped Bengal. This is simply not true and this page will demonstrate the many distinct differences between these two breeds to help guide us into better understanding. We will use the respective breed standards from TICA as well as some photos to demonstrate these distinct differences. Note the distinctly sharp changes in planes of a Toyger profile creating the 1/2 hexagon. Note the Bengal profile is soft countours like an egg. Toyger - Medium-sized. Long, broad and deep. Side view: 1/2 hexagon as defined by angle change points of chin, nose, forehead and back skull. All contours well-defined, muscular and rounded. Bengal - Broad modified wedge with rounded countours. Longer thant it is wide. Slightly small in proportion to body. The skull behind the ears makes a gentle curve and flows into the neck. Allowance to be made for jowls in adult males. Overall look of the head should be as distinct from the domestic cat as possible. Bengal - Medium to small, relatively short, with wide base and rounded tops. Set as much on side as top of head, following the contour of the face in the frontal view, and pointing forward in the profile view. Light horizontal furnishings acceptable; but lynx tipping undesirable. Bengal - Oval, almost round. Large, but not bugged. Set wide apart, back into face, and on slight bias toward base of ear. Eye color independent of coat color except in the lynx points. The more richness and depth of color the better. 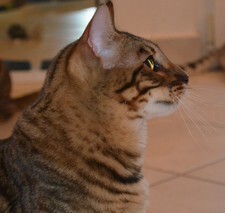 Bengal - Strong chin, aligns with tip of nose in profile. 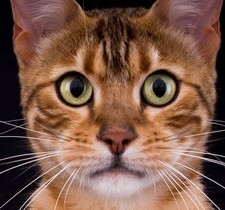 Toyger whisker pads are in inverted "heart" shape with the theoretical point between the eyes. Note also the length of muzzle from eyes. 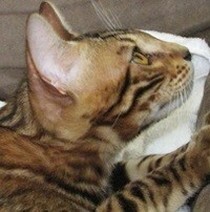 Whisker pads are puffy "ball" shaped in a Bengal. Notice the very short muzzle length. 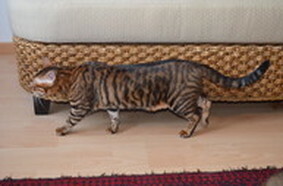 Toyger - Medium length to long and deep with well-defined, rounded muscular contours. Full face view: a long inverted heart shape from forehead to rounded whisker pads. Toyger - Muscular, long, and rounded, widening toward end to at least as wide as the space between the eyes. Greater nose leather width is preferred, depth is shallow. 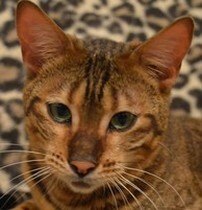 Bengal - Large and wide; slightly puffed nose leather. Bengal - Curve of the forehead should flow into the bridge of the nose with no break. Bridge of nose extends above the eyes; the line of the bridge extends to the nose tip, making a very slight, to nearly straight, concave curve. Toyger nose leathers are to be as wide as the distance between the eyes. Note the shallow depth of the leather. Paltium shows great ear set and rounded tips too! Bengal nose leathers are puffy and have a much greater depth from top to bottom. Bengal - Long, substantial, muscular; in proportion to the head and body. 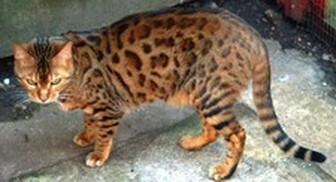 Toyger - Medium to deep, long and muscular with rolling contours; strong and robust but not blocky. Strength is in the forequarters. Shoulders may interrupt top line. Chest is broad and deep, never interrupting neckline from head to foreleg. Bengal - Long and substantial, not oriental or foreign. Medium to large (but not quite as large as the largest domestic breed). Toyger - Medium length such that the space between the ground and the body is equal to the depth of the torso. Legs as long in back as in front. Long toed, well knuckled feet seem large. 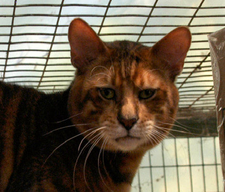 Bengal - Medium length, slightly longer in the back than in the front. Feet: Large, round, with prominent knuckles. Toyger - Very long and muscular with blunt rounded tip; rope-like. Set low and carried low. Bengal - Medium length, thick, tapered at end with rounded tip. Toyger body shape shows strength in front, being strong and deep. Body is long. Hindquarters are same length as front with rolling gait. Bengal bodies show the distinct higher hindquarters being longer than the front. Strength is in the hindquarters. Bodies are also long. Toyger - Very large, dense, robust; never delicate. Toyger - Very muscular and athletic looking, especially in young males. Bengal - Very muscular, especially in the males, one of the most distinguishing features. Toyger - Coat is short except: markings may be slightly but uniformly longer than ground colored fur on body for a sculpted and jowl ruff fur is effect. Longer temple preferred. Bengal - Short to medium. Allowance for slightly longer coat in kittens. Toyger - Fur is thick, luxurious and unusually soft, plush but resilient. Bengal - Dense and luxurious, closelying, unusually soft and silky to the touch.